A new broad range antibiotic, developed jointly by scientists at The Rockefeller University and Astex Pharmaceuticals, has been found to kill a wide range of bacteria, including drug-resistant Staphylococcus (MRSA) bacteria that do not respond to traditional drugs. The antibiotic, Epimerox, targets weaknesses in bacteria that have long been exploited by viruses that attack them, known as phage, and has even been shown to protect animals from fatal infection by Bacillus anthracis, the bacteria that causes anthrax. Target selection is critical for the development of new antimicrobial agents. To date, most approaches for target selection have focused on the importance of bacterial survival. However, in addition to survival, the Rockefeller scientists believe that molecular targets should be identified by determining which cellular pathways have a low probability for developing resistance. The path to identification of this new target spanned more than seven years of effort. Fischetti and his colleagues used a phage-encoded molecule to identify a bacterial target enzyme called 2-epimerase, which is used by Bacillus anthracis to synthesize an essential cell wall structure. In 2008, Fischetti’s lab, with Rockefeller’s Erec Stebbins and his colleagues in the Laboratory of Structural Microbiology, solved the crystal structure of this enzyme. Based on this work, the researchers identified a previously unknown regulatory mechanism in 2-epimerase that involves direct interaction between one substrate molecule in the enzyme’s active site and another in the enzyme’s allosteric site. Fischetti and his colleagues chose to target the allosteric site of 2-epimerase to develop inhibitory compounds, because it is found in other bacterial 2-epimerases but not in the human equivalent of the enzyme. Through the collaboration with Astex, initiated by co-author Allan Goldberg, an inhibitor of 2-epimerase named Epimerox was developed. Raymond Schuch, a former postdoctoral researcher in Fischetti’s lab, tested the inhibitor in mice infected with Bacillus anthracis. He found that not only did Epimerox protect the animals from anthrax, but the bacteria did not develop resistance to the inhibitor. 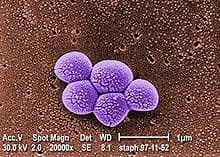 The researchers also found that Epimerox was able to kill methicillin-resistant Staphylococcus aureus (or MRSA) with no evidence of resistance even after extensive testing. Their work was published this week in PLOS ONE.